← Why Are Americans So Fat? About a month before my wedding, the stress of planning was really getting to me. On top of that I was switching jobs which is stressful on its own, but add the stress of a DIY wedding and it got quite overwhelming. I wasn’t sleeping very well, my energy levels during the day left a lot to be desired, and my body was reacting to the stress by sending me cravings for poutine and potato chips, which is not ideal a month before your wedding, especially when you have a form fitting wedding dress to fit into. I decided to deal with the stress by doing somewhat of a raw food cleanse. The cleanse was all hands on deck, full stop raw food eating 100%. No cooked food, no animal products, and no processed food or junk. Unfortunately (or maybe fortunately) this cleanse also excluded coffee. As a coffee drinker since I was a teenager, this was a difficult adjustment. Whether you are cutting coffee for good or just for a period of time, it is quite difficult, but it can be done. Here are a few tips I have for you. Caffeine is a drug, and it is therefore quite addictive. I had withdrawal symptoms during the first few days of my cleanse. Because of this, some people would do better to phase caffeine out rather than just pull the plug all at once. A good way to phase caffeine out is go from coffee to green tea, and then drink less and less until you can quit all together. The weirdest part for me was not waking up, pouring a cup of coffee and settling in to do some blog work. This had been my routine for years, and it threw me off to disturb it. It felt wrong to start my morning without coffee. After the first couple of days I made myself de-caffeinated tea to replace the coffee and it helped a lot. Don’t switch up your routine when you are trying to break a habit! Find a replacement for your ritual. Hopefully you come equipped with the knowledge that sugar leads to insulin spikes, which then crash and make you feel lethargic and generally like crap by the end of the day. This is mostly true of refined sugar, not so much natural sugars found in whole foods like fruits and vegetables. Caffeine gives you energy which you will miss, so don’t make it extra awful for yourself by continuing to eat a diet high in processed foods with tons of sugar. If you read up on cutting back on caffeine, you’ll find a lot of people saying that for them, the first few days were the worst of the bunch. The first few days were bad for me, too. If I could stay busy and distracted, I was fine but there were many times that I wandered past a café and wanted nothing more than to pop in for a black coffee. But, then the cloud clears. You’ll likely have headaches and be very lethargic for the first few days, but if you can see it through, and remind yourself that those are temporary, you’ll see the benefit! I had a ton of energy when I finally came out of the other side, and I found that I generally felt better. I’m sure that was in part because of the raw, whole food diet, and also in part because of the lack of stimulants, but I got less tired by the end of the day and I slept like a baby. Have you tried quitting caffeine before? What did you find helped? I have quit caffeine for different periods of time before. I have started using it in moderation, instead of all the time like I used to. To begin using it in moderation, I quit it for a week, then slowly added it back, but no more than one cup of coffee and not everyday. 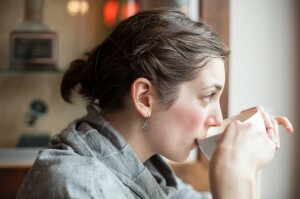 The benefits of caffeine are so much greater when used in moderation. So true – everything in moderation. Caffeine is not terrible for you but it’s not good when consumed in excess. Wow, never tried coffee ?! I have never really wanted to quit caffeine but I have quit diet coke more than once. I am usually better off when I quit cold turkey. I’m lucky – I’ve never liked carbonated drinks so I haven’t gotten into drinking pop. I was never a coffee fan, and when I do drink coffee – out at breakfast for example – I add tons of cream and sugar to it to mask the bitter taste! My caffeine drug of choice was – and is – tea! Like You though, I switched to decaf tea about seven years ago and haven’t looked back! I drink about six to eight cups of tea a day, so the decaf tea works wonders for me. Glad you were able to kick your caffeine “addiction”! Wow! That’s a lot of tea! I used to be able to do this cold turkey, but this time around I’ve had to phase out! It’s so addictive and I’ve had such a hard time building my energy levels back up without it.